While Versailles is a household name, most tourists have never heard of the Chateau de Vincennes. Yet it's a formidable castle situated at the near eastern border of Paris — and easily accessible by hopping on the Metro. A true medieval fortress complete with a donjon (keep), towers and moat, the castle was a key site for the Kings of France from as early as the 12th century. It also served to protect Paris from foreign attacks, and the monarchy from popular uprisings. It has long since been taken over by the French state, and now mostly serves as a reminder of royal power and military prowess. Still, it's worth a visit for anyone interested in French medieval history and monarchy, especially as part of a day trip to the sprawling, leafy Bois de Vincennes park. The site where the present-day chateau stands was originally the grounds for a royal hunting lodge, commissioned by the French King Louis VII in the mid-12th century. These royal grounds were subsequently expanded by Kings Philip Augustus and Louis IX into a large manor. During the mid-to-late 14th century, it was significantly expanded into a defensive medieval fortress. King Philip VI ordered the construction of a 170 foot-high keep, or donjon, which was then Europe's tallest. It would take about two centuries and successive royal orders to complete the structure's grandiose, rectangular fortified walls, flanked by nine dramatic towers. These were completed in around 1410. Many royal families took up residence in the donjon over the centuries, and the Chateau de Vincennes was a place of both marriage and birth for numerous monarchs. Philippe III and IV of France were married there, while King Henry V of England perished in the donjon in 1422, following a bloody siege at the French town of Meaux. Charles V had a personal library built at the chateau. The powerful King Louis XIV (also known as the "Sun King" periodically resided at Vincennes while the Palais de Versailles was under construction. There's an interesting connection between the Chateau de Vincennes and the Sainte-Chapelle in central Paris. While the latter was under construction, Vincennes was elected to temporarily hold the relics of the Crown of Thorns. The Chapel at Vincennes, likely built by the same architect responsible for the Sainte-Chapelle. still holds a fragment from the crown. During the French Revolution of 1789, a mob of around 1,000 workers attacked, pillaged and partly demolished the Chateau. For a period after the Revolution the Chateau was abandoned, temporarily serving as a porcelain factory. During the reign of Emperor Napoleon I, the Chateau was transformed into an arsenal and military barracks. It once again served as a defensive site against external attacks. Although it was no longer under royal control, the Chateau continued to serve as a prison during the 19th century. Famous inmates included controversial writer the Marquis de Sade. The Chateau also has an interesting place in the dark history of World War II and the Nazi occupation of Paris. During the battle for Paris' liberation in August 1944, Waffen-SS German soldiers arrested and executed 26 French policemen and members of the French Resistance at the Chateau. After learning that Paris had been liberated by Allied troops, the SS soldiers set off explosions at Vincennes, badly damaging parts of the fortress. It's therefore an important, if overlooked, memorial site reminding us of Nazi atrocities and those who resisted them. Today, the site houses an important collection of military and defensive archives, as well as a library. The striking medieval fortress can be visited in about 90 to 120 minutes (a bit more if you choose to visit the upper levels of the donjon by guided tour). When touring the exteriors and ground floor, notice the enormous moat (once filled with water), enormous, rectangular fortified walls and dramatic donjon. The latter remains Europe's tallest remaining medieval donjon. It's easy to imagine how powerful this chateau must have been during the medieval period, when it would have been one of the most prominent structures on the horizon. Also make sure to see the Gothic-style Sainte-Chapelle de Vincennes, completed in the late 14th century and boasting delicate stained glass. It's similar in many ways to its grander counterpart in Paris. 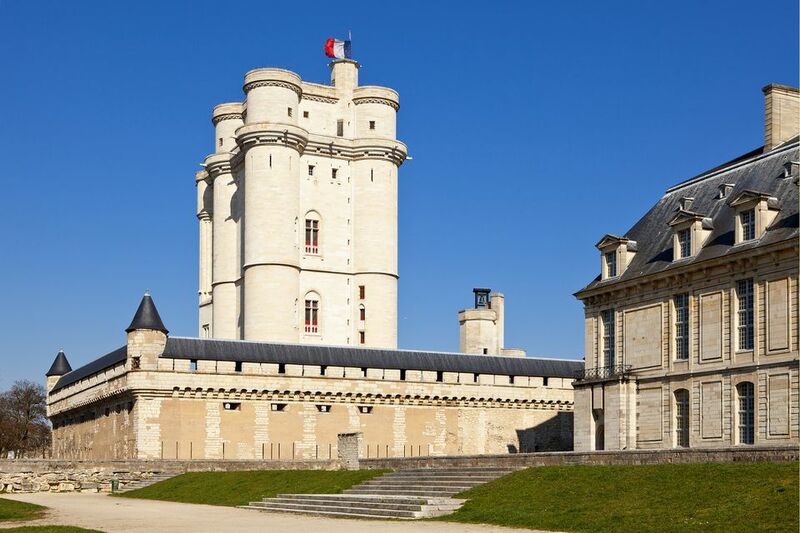 ​It may be worth taking a guided tour to climb to the upper levels of the donjon and gain perspective over the Chateau, the wooded park of Vincennes, and the skyline of Paris in the near distance. There's an onsite gift and bookshop where you can peruse memorabilia, art items and books. There are no onsite restaurants or cafes at the Chateau, but the Bois de Vincennes houses several restaurants and cafes. The chateau is located in the eastern near suburb of Vincennes, easily accessible by Metro or RER commuter line train. From central Paris, the easiest way to get to the Chateau is to take Metro Line 1 to Chateau de Vincennes, then follow signs to reach the entrance. You can also take the RER A (commuter train) to Vincennes. Board from Chatelet-les-Halles or Nation; it's only a short trip to the east. Bus lines 46, 56, and 86 also serve the Chateau. Accessibility: The site is accessible for visitors with hearing and sight impairment. It is only partly accessible to those with limited mobility or in wheelchairs (mostly the outside areas and ground floors). An accompanying aide is required due to an inclining slope and the presence of cobbles. The donjon and "chatelet" are not accessible. partially accessible (outside areas, ground floor from donjon). The site is equipped with accessible bathroom facilities. See more information about accessibility at this site here (click the "Disability" tab). From September 22nd to May 20th, the Chateau is open daily from 10 a.m. to 5 p.m. From May 21st through September 21st, it remains open until 6 p.m. each day. The gift shop and bookshop have the same hours. It is closed on the following bank holidays: January 1st, May 1st, November 1st, November 11th and December 25th (Christmas Day). Tickets are 9 euros most visitors, though entry is 7 euros for guests under 26 and over 65. Visitors with European Union passports or ID cards can enter for free. It's not generally necessary to pre-book or get skip-the-line tickets for this attraction, but if you prefer to, you can book online at this page. If you'd like to take a guided tour of the Chateau, you should know that they're only offered in French at this time. However, self-guided audio tours are available in numerous languages and will suit most visitors. Please note that the upper levels of the keep are accessible by tour only; these must be pre-booked by telephone. See this page for more information and contact details. Again, these appear to currently be offered in French only. The main attraction nearby the Chateau is the sprawling, leafy Bois de Vincennes park. The draws of this "wood," one of two that surround Paris, are numerous. They include hundreds of acres of wooded paths, lawns perfect for picnics, man-made ponds and even an old-fashioned horse-racing track. If you're interested in plants, head to the arboretum and botanical garden (Parc Floral) filled with lush blooms, mini-golf course and a stage reserved for laid-back summer jazz concerts. On a warm and sunny day, follow your visit to the Chateau with a picnic lunch in the park, or rent a rowboat and enjoy the man-made lakes. A long walk through the wooded trails is also a lovely way to spend a day. Since both the Chateau and park are right outside the city limits, they make an ideal day trip when you don't have a lot of time, but still need a bit of fresh air and reprieve from the urban grind. Finally, the town of Vincennes itself can be fun to wander around. The main shopping streets around the metro aren't extensive, but have a relaxed, almost village-like feel. If time allows, explore the town a bit before hopping on the train back to Paris "proper."